One glance at my time blocking schedule just told me that I have about 30 minutes to finish outlining and writing intros for the four blog posts I’m working on this week. Then I’ll use the next 30 minutes to get ready for the day, eat a snack, and make the bed. After that, Mozzie and I are off for our morning walk and then I’ll have an hour of “buffer time” before lunch. What’s “buffer time”? Hang tight and we’ll get to that! When I first read about the idea of time blocking, it sounded like far too rigid of a way to plan my day. I figured it would stress me out and make me feel like a failure when things didn’t go to plan. Shockingly, that’s not the case at all! I get so much important work done without getting distracted by every little distraction or task that pops up. So let’s look at the strategy of time blocking! I’ll explain how and when I use it, the benefits I see because of it, and how you might use it too. What Is Time Blocking & How Do I Use It? 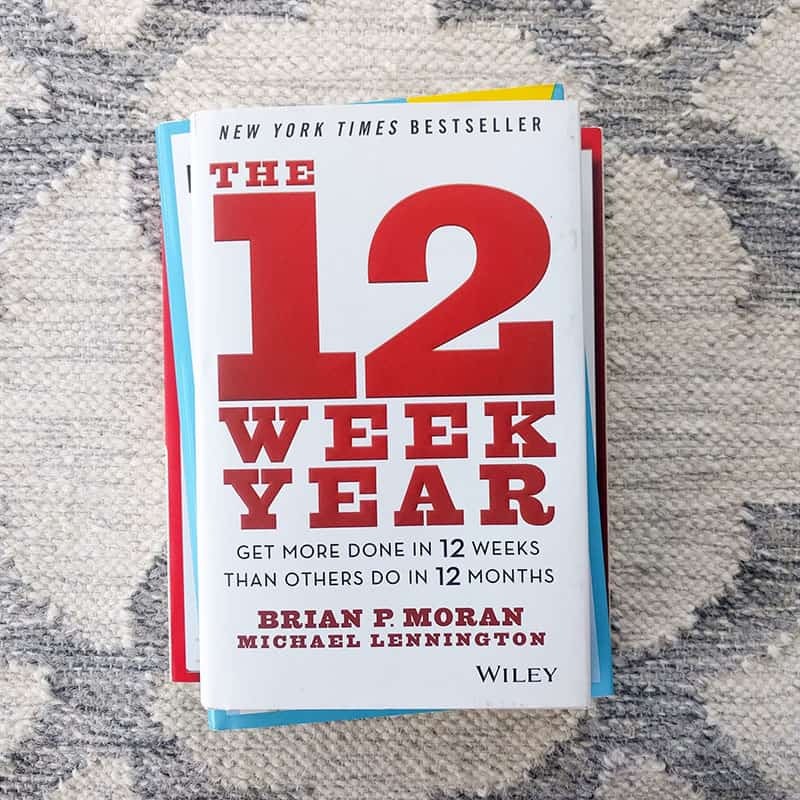 I first paid attention to the idea of time blocking while reading The 12 Week Year. The whole book was a game-changer for me in how I set goals, plan my days, and get stuff done. 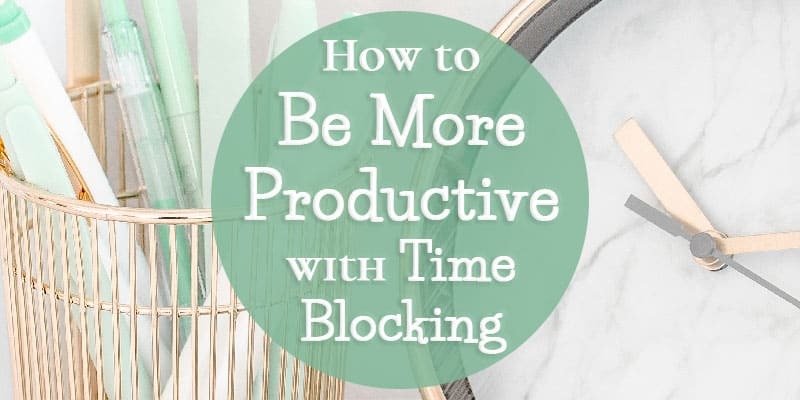 Time blocking is basically setting up a schedule for yourself where you’ve decided how you’ll spend each chunk of time. I use time blocking every week for Monday-Friday, 8am-4pm. These are the hours that Austin is at work and I try to fit all of my work into these hours too so that we can both not be working in the evenings. I set up a simple spreadsheet with the days listed on the columns across the top and times going down the first row. I use half hour increments. Put any scheduled appointments on the spreadsheet. Add one hour of “buffer time” to each day. I almost always do this from 11am to noon. Add in my non-work activities: getting ready for the day, walking the dog, lunch, and prepping dinner happen at about the same time each day unless I have an appointment that throws things off. Plan my work! This varies week to week, but I decide what chunks of time to use for various work tasks. Some things will take a few hours, others only need one half hour chunk. That’s it! By the end, my time blocking spreadsheet is quite full and ready for the next week. I like to color code my blocks so that similar activities stand out in the same color, but it’s not necessary at all. Below is an example of one of my weeks where I didn’t have any appointments or out-of-the-ordinary things happening. The empty blocks don’t mean that I’m not doing anything. They’re blank because I need that time for the task above them. So in the spreadsheet below, I plan to spend from 12:30-3:30 on Monday working on “DCA Module 1”. I work on a task until the next time slot with something new written in it. Also in the spreadsheet below, I added flex time on Friday. I had a lot of tasks that week that were hard to estimate how much time they would take. I added in empty “FLEX” time so that I could catch up if something took longer than I gave myself earlier in the week. I don’t often add in flex time, but it was a week with new things happening, so I wanted extra flexibility. 1. Buffer Time is Amazing! 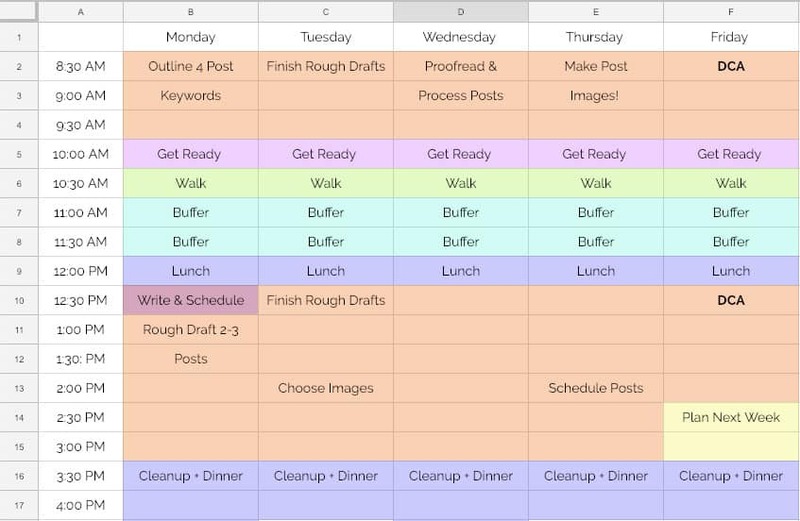 With the plan laid out in The 12 Week Year, you’re supposed to schedule one or two hours of buffer time each day. Buffer time is the time of the day when you deal with a bunch of low-value, little tasks. You can check and respond to emails, post on social media, make phone calls, text someone back, or do any other random things that pop up. These tasks usually cause interruptions to your day and make it so you don’t do any focused work. By scheduling a specific chunk of time to take care of them, you limit how much they impact your day while still being confident that you’ll get to them. Having buffer time also means that if it’s not buffer time, you should not be checking email, texting, glancing at Facebook, or anything other than what the time block says you’re supposed to be doing. I found this difficult at first (who knew I checked my email so often? ), but I do much more productive work when I work without distractions! When you only allot and hour and a half to a project, you work really hard to get in done within that hour and a half. 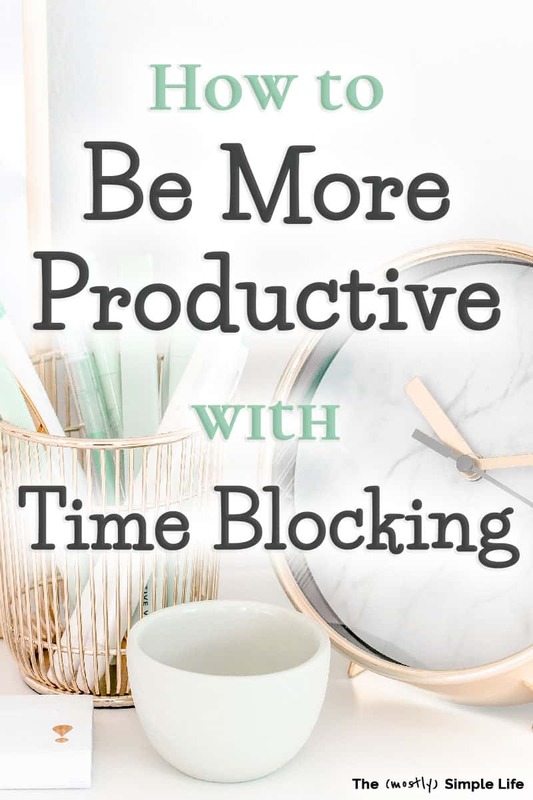 When I first started time blocking, it was difficult to plan my week because I wasn’t sure how long certain tasks took me, especially because I was used to working very distractedly. Should I plan thirty minutes to draft a blog post or three hours?! It took some adjusting as I went until I figured out about how much time I would need. I find that I can get a lot more done in a chunk of time than I ever would have estimated when I give myself a time constraint. I could search for hours for the perfect image to use in a post, but if I only give myself one chunk (thirty minutes) to find images for three posts, I still get it done! I go into each week with a plan and I know what I should be doing at every point in the day. This allows me to get to important projects that have been pushed back and pushed back again. Now, they’re on the spreadsheet and I have time scheduled for them! The biggest downside of time blocking is probably that it lacks flexibility. When I first started, I was worried that I would get insanely stressed out if something unexpected popped up. When I have an unexpected appointment I need to go to, I can definitely edit my time blocking schedule for the week to accommodate it. It’s not carved in stone. I am in control of it! The great part is that I find myself making the most of my time when I have to be flexible because I still want to get everything done that I had planned. This means I’ll bring my computer to the car dealership and work while I wait when I might have normally given up on my productivity and scrolled on Instagram the whole time instead. I’ll get back to work immediately when I get home from the doctor instead of puttering around for a while instead, because I want to make the most of the time I have. It’s hard to explain, but I stay motivated and find myself making the most out of the moments I have, even when I have to be flexible with my schedule. 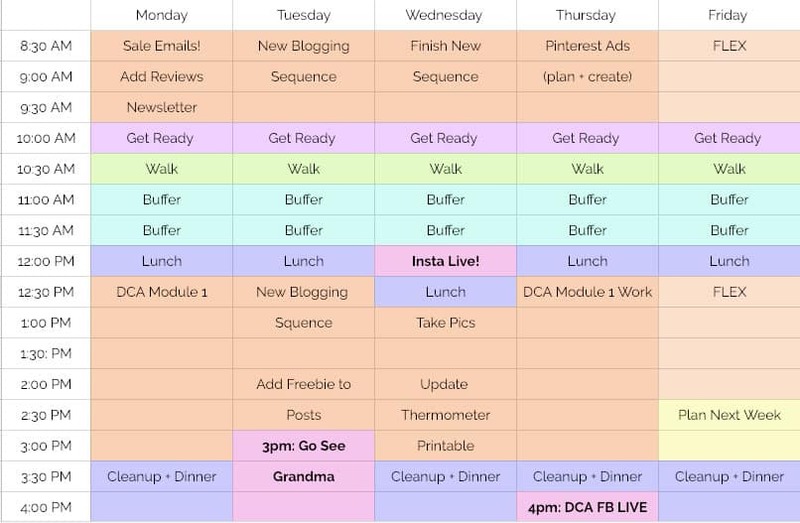 I work from home as a blogger, so I use time blocking to schedule my normal working hours. This is not the only way to use time blocking though! The whole point is to use your time intentionally, which everyone can benefit from. Parents: You could time block your days or evenings to set aside focused time to spend with each child as well as to schedule time to accomplish personal goals you may think you don’t have time for. You could time block your evening so that you have time to relax as well as time set aside to build your side business. At your job, you could use time blocking to make sure you have time to work on important projects that will lead to your promotion. As a retiree, you could time block your week so that you intentionally spend time exercising, with friends, working on hobbies, and whatever else you’ve got going on. The important thing to remember is that it’s your time blocking schedule. You have the right to adjust and edit it. It’s there to serve you and help you spend your time intentionally. Emails, Instagram, text messages, random online articles, phone calls, and other “low-value” activities eat up so much of our time if we’re not careful. Time blocking is a way to make sure little low-value things happen, but don’t take up the majority of our days. Open a spreadsheet document. I use Google Sheets, which is free! Across the top row, write the days of the week. Down the first column, write in the times you’ll be scheduling. You can do hour or half hour periods. Write in any scheduled appointments or meetings you have for the week. Plan in at least one hour of buffer time each day. Fill in the rest of your time slots with important work, projects, or activities you want to make happen! There is no end to the distractions I encounter while working from home! Some of them are clearly not great: taking a nap, watching TV, or going shopping. Others can feel productive but aren’t what I should actually be working on: checking email, scrolling on Instagram, or folding laundry. Time blocking has allowed me to be productive and avoid distractions. I know that I can get all of my most important work done throughout the day and I have a plan for all of the random to dos that pop up and need to be dealt with because of my buffer time. I encourage you to try time blocking for a few weeks and see if it helps you get more out of each day! This sounds great! I was definitely too unorganized last year (but it was my first year, so I give myself the grace of figuring things out 😉 ) and this month I’ve set up a content planner, organized all of my documents and income/expense trackers, and the house in general, and I feel so much more productive already!